Matt Martinez is the Director of Content for KPLU Seattle-Tacoma. He is responsible for all on-air and digital content. Prior to arriving at KPLU, Martinez was the Senior Producer for NPR Programming. He led a team of producers responsible for developing new show and podcast pilots, supporting live events, and supporting stations in their fundraising efforts. 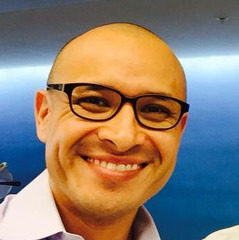 Martinez came to NPR in 2000 as a producer for NPR's afternoon flagship newsmagazine All Things Considered. He's also worked on the team that produces Weekend Edition Saturday with Scott Simon, and created The Bryant Park Project, a multi-platform morning show on Sirius Satellite Radio produced at NPR New York, hosted by Alison Stewart. He served as the show's Supervising Senior Producer until it ended production in July 2008. After Bryant Park he ran the weekend version of All Things Considered. During his time there he overhauled the sound and editorial direction of the program, successfully reinvigorating the format by launching A-segment cover stories, the in-depth news-features that now begin each hour of the weekend broadcast. He returned to weekday All Things Considered in 2012 as Supervising Senior Producer where he led the show's staff of producers and editors, shaping the sound of the daily broadcast. Martinez began his career at public radio station KNAU in Flagstaff, Arizona. He started on weekends as the local host for the afternoon programs – which is a fancy way of saying he gave the weather and local funding credits during Car Talk. He also butchered the names of countless classical music composers before being shuffled off to something he was good at: news. He became a reporter and then the local host of All Things Considered. As a newsmagazine producer, Martinez has been involved in some of the biggest stories of the past two decades. He was part of NPR's award-winning coverage of September 11th, reporting from New York with Robert Siegel on the day of the attacks. He was at the helm of All Things Considered the day of the Boston Marathon bombing, leading the staff through a week of live coverage. His work as a field producer with NPR hosts and reporters ranges from codeine syrup abuse in Houston to Sudanese refugees in Portland, Maine, to the "Shed Boys" of Port Townsend, Washington, to reporting on the New Hampshire Primary. He graduated from Northern Arizona University.